The spiritual beauty and natural majesty of historic Machu Picchu is the spot for an adventurous and unforgettable honeymoon. 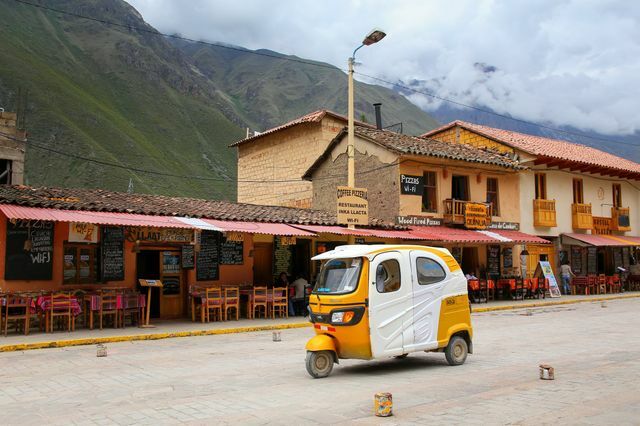 Drawing backpackers to money-is-no-object adventurers, Machu Pichu appeals to a wide demographic of travelers seeking an excursion. If you want an active honeymoon, Machu Pichu is probably the place for you! Machu Pichu is relatively easily accessed from the city of Cusco. Many travelers will take train to the town of Aguas Caliente before taking a bus too Machu Pichu, although one can also hike in an enter the Sun Gate. Those with spare time and the willingness to undertake a multi-day hike should definitely consider it. Once there, Machu Pichu can be done as a day trip or one can stay a few nights, albeit at prices accounting for the popularity and captive audience. Once there, you can take in the sights of the city, surrounding settlements, mountains, and the river valley. The Temple of the Sun, the Sun Gate, and the Main Temple will be the prime highlights for most of your fellow visitors. What you can see depends on your time and energy, as exploring the city can be taxing going up and down hills and (possibly) the twin mountains if you’re not used to the effort and/or effects of the elevation. Admission to the city and many hiking trails are controlled by the government and the per-day limits are strictly enforced. Book as far in advance as possible or be prepared to get to the city as early as possible before the limits are reached. This advice is particularly pertinent during the high season. Here's how to plan a Machu Picchu honeymoon. Machu Picchu enjoys a generally warm daytime climate and has two seasons: wet and dry. The dry season occurs May-September and the wet season from October to April. By far, the high season corresponds with the dry season. For an easier journey, go at this time of year. Going during the wet season can put you at risk of weather related delays. Sun Gate: This prominent structure’s location is an excellent vantage point to take in stunning views of the valley. Get here at dawn to see the sun rise “through” the gate. Temple of the Sun: Perhaps the “best” building in the city (not surprising in a culture which worshipped the Sun God as the prime deity), the construction and decoration represent the pinnacles of Inca construction and aesthetics. Temple of the Condor: This temple’s legacy has a much darker side, as it historically housed prisoners and was the site of their sacrifice. The stonework is meant to be in the shape of a condor, which symbolized the link between the earth and the divine. Winawayna: This terraced settlement of houses and fountains on the way to Machu Picchu is a quieter spot than the much busier main city, and its terraces will be familiar to anyone acquainted with pictures of the greater region around Machu Picchu. Belmond Hiram Bingham: This luxury train from Cusco makes the journey part of the Machu Picchu experience as you trundle through the Andes with champagne, canapes, and a gourmet meal. Vistadome Train: For those wishing for a scenic train but at a more affordable price than the Belmond Hiram Bingham, the mostly glass Vistadome viewing cars are a great budget-friendly alternative. Main Temple: The large temple structure will be on a must-see short list for most visitors. Cerro Putukusi: Not far from Aguas Caliente (the launching point to Machu Picchu), the summit of this mountain offers a bird’s eye view of the ancient city and the river valley. Huayna Picchu: This mountain immediately behind Machu Picchu was the residence of the high priest of the city. The climb is arduous but rewarding – book in advance to guarantee access. Temple of the Moon: Built into caves, this less-trafficked site may have served as a burial place and can offer a honeymooning couple respite from the crowds. Intimachay: The “Cave of the Sun” was built in such a way that only for 10 days before and after the December solstice (Dec 20 to 23 depending on the year), the rear wall is illuminated by the sun’s light. Helicopter Ride: For the best view of the city, consider a helicopter overflight.